A perfect treat for Valentine’s Day! Taylor Braxton, along with a few adventurous girlfriends, decides to test one such superstition on Valentine’s Day – the day Taylor’s ex-fiancé is to be married. A few bottles of wine help lower her inhibition and go a long way to giving her the courage to try to heal her broken heart. After all, Taylor reasons, what is the worst thing that can happen – the superstition of finding her true love might come true? Sheriff Ryan Jones is used to getting calls about the odd dancing around the downtown fountain. When you live in Cupid, Texas, there were always some residents who believed if you dance naked around the fountain, you were guaranteed to find your true love. What he doesn’t expect is to find the lovely, but spirited Taylor Braxton confronting him at midnight – sans clothing. Unfortunately, a long-held promise and his badge stand between him and what he wants – Taylor. Will the Cupid Superstition help Taylor and Ryan overcome the past and take a chance on love again? Or will a promise he made to her best friend, and his career, deflect Cupid’s arrow? 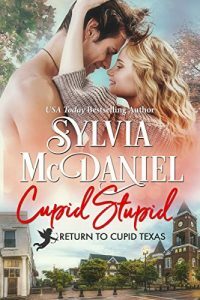 USA Today bestselling author Sylvia McDaniel has published more than thirty western historical romance, contemporary romance and even a few sci-fi novels. Known for her sweet, funny, family-oriented romances, Sylvia is the author of The Burnett Brides a historical western series, The Cuvier Widows, a Louisiana historical series, Lipstick and Lead, a western historical series and Return to Cupid, Texas a contemporary series.